Capsule Parfums describes Brood as "old soul spice...a progressive take on ancient ceremonial fragrance." Often, in perfumers' argot, "ceremonial" means incense, and though I love incense fragrances in autumn and winter, by spring I'm getting tired of them — no more smoke or ash, please. Only Eau d'Italie Paestum Rose and L'Artisan Timbuktu remain in rotation during warm weather (and many may not consider them "true" incense fragrances). 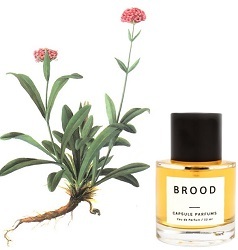 Now, a new summer-incense-y perfume has caught my attention: Capsule Parfums Brood. Certain herbs, spices and flowers (plum comes to mind, along with other strongly-scented spring blossoms) have an light-incense vibe. Capsule Parfums has chosen wisely by including a heavy dose of spikenard (Nardostachys jatamansi) in Brood; spikenard (a relative of valerian) smells "profound" and is used in incense blends in Asia. Spikenard was used in ancient times as a food flavoring and was included in perfume recipes in Egypt, Greece, Rome and the Middle East. Spikenard is used as a drug, especially in Ayurvedic medicine and has been shown to be a strong free-radical scavenger — showing protective properties against radiation. Spikenard grows at high elevations in the Himalayas and is endangered due to over-harvesting (projects to produce sustainable spikenard are ongoing in Nepal). Though "brood" means to "think deeply" and "to ponder," Capsule Brood makes me feel happy...and a little hungry. Brood goes on smelling peppery with hints of old-style patchouli and vanilla. Quickly the scent of tangy/green (almost chive-y), rooty/vegetal, earthy spikenard makes itself known (it's a complex aroma). A wonderful musky, overripe fruit note appears, too. Spikenard remains in the forefront as Brood develops and either becomes a bit minty or is joined by mint; a sheer vanillic note casts a semi-sweet haze over Brood's dry-down. Brood has good sillage and lasting power. Spikenard would mix well with many notes: galbanum, mint, vetiver (another root-y scent), cedar and moss (all those notes seem part of spikenard's genetic composition). Smelling spikenard in Brood makes me want to taste it, so I may investigate including spikenard in a savory sorbet (in place of mint or lavender), a tomato chutney or vegetable curry. In the right hands and amount, spikenard would also add distinction to a strong cocktail. Capsule Parfums Brood features notes of cardamom, pink pepper, apricot, guava, rose absolute (Egypt and Morocco), patchouli, spikenard, vanilla absolute, oak moss, leather, cedar, vetiver, hedione, cetalox, musk. It is $90 for 50 ml Eau de Parfum at the brand website. Note: top image via Capsule Parfums. Lower image of Nardostachys jatamansi via the Institute for Traditional Medicine, Portland, Oregon. I’m not at all sure I’d like this; I think I tried L’AP Jatamansi and did not like it. But after reading your review of Brood, I am very curious to try it. BTW, have you smelled rue? That’s another ancient aromatic plant that’s a both a bit unpleasant and compelling. Noz, yes I love those ‘old’ weird scents…like boxwood, rue…. I’m a big lover of spikenard, and was very disappointed when the original Jatamansi was dq’d (current iteration does not smell like spikenard). This sounds very interesting. Thanks for reviewing! Rappleyea, this one has a stronger spikenard than Jatamansi. I loved the original L’Eau de Jatamansi by L’Artisan and I was disappointed with their new version, a powdery lavender frag, but Capsule’s perfume seems to gourmandize the scent too much for my taste. I cannot deal with vanilla notes, for the most part, especially in incense perfumes. I would sniff this if I had a chance but that’s about it. Akimon, you will definitely notice the vanilla. This definitely sounds like it’s sniffworthy. I like spikenard and have an eo I’ve never played with so this is inspiring me to do so. I actually have a friend in Nepal who is part of the initiative to grow sustainable spikenard in the region. Like you, I’m also a fan of rue and boxwood – funny how they do seem “old”. I checked out the Capsule Parfums website and am intrigued…have you tried anything else they offer? Thanks for the review! Holly: Yes, I’ve enjoyed many from the Capsule lines…reviewed some of the Fiele scents on NST last year. This sounds so interesting. I am always compelled by your positive reviews. Oh also I see that they are related to Fiele, whose perfumes I tried after your review a while back. Did you ever try Viola? I love it. Amy, yes…finally got around to sniffing Viola and like it…the lavender one, too.